Cambelts are an essential part of your vehicle and not replacing your cambelt at the manufacturer’s recommended guidelines can result in serious damage to your car’s engine. 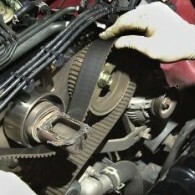 Q.What has to be done to repair an engine that has suffered from a snapped belt/chain? Q. I’m going away on holiday and taking my car, I know the cambelt needs changing but I cant afford it, what would you do? A. While travelling to your holiday destination and you’re on the motorway – if the cambelt fails your car will STOP. You will be have to be recovered off the motorway to the nearest garage and it may take several days to repair and several hundred pounds. The simple answer to your question is – get a belt fitted.